The writer, an expert in developing client server and web based financial systems, designed numerous systems and provided usability and marketing related site traffic analysis including data mining for some of the most heavily visited sites including 3COM, Wall Street Journal, consumereports.org. This brief (I hope) tutorial extends the topic of Locals and directories. 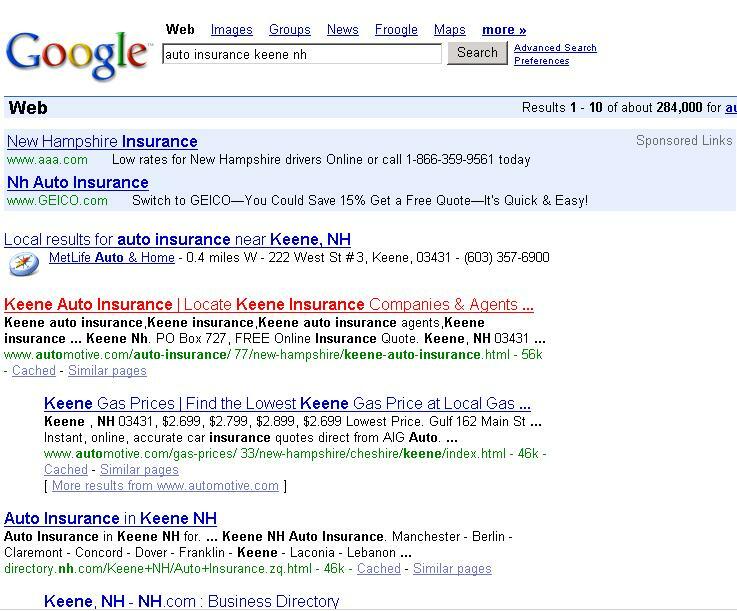 It illustrates the results of the Google search with the search phrase "auto insurance keene nh"
Disregard the adWords section (shadow background) at the very top. One has to pay for that. Right below it there is the Local results area that shows MetLife local office. Usually there are three agencies out there (apparently agents in or around Keene NH do not use Net much). Now take a look at the main search results area at the picture above. Usually it will bring results for national insurance companies like prograssive, insweb, essurance etc. Look for results with domain name that seems to be a directory like superpages etc etc. Why directories are so important - yellow pages type access. What is the main difference? Mainly in user habits. Users that like the precision of the yellow pages type search go straight there and find lots of choices. Others prefer Google or yahoo simply out of habit as a sort of a single point of entry into the Net's information space. Why use both? Precisely for the above reason - cover as many bases as you can. Together with carriers' Find an Agent listings they will cover the majority of all possible searches. See the precise instructions in the end of the newsletter #1 Here we give a number of tips/tactical advises. Use you agency's locations, use own/family/partners home addresses (still give the the same phone number of course) as many addresses in different towns/zips as possible. The motivation is clear - maximum coverage. For example if somebody searches for "auto insurance Natick MA" and "auto insurance wayland MA" you will be there for those two neighbouring towns. To summarize: cover all towns as many miles from your agency's physical location as possible. You will invest 1 hour but cover large area of potential customers. Do search on a number of towns your agency covers in search engines to see which agencies from which directories are on the top of search results Those are the directories a search engine (e.g. google but do for each incl. yahoo) loves. Find out how expensive they are and start experimenting first maybe with free directories' listings. This is an iterative process! How to test the effectiveness of you directory selections. Use your site statistics. Here is how. Login into your account at sites4agents.com and find Site Statistics blue button. On the Statistics Menu select Visits By Referer. Other statistics tools are important also but more for site look and feel analysis. After selecting time interval press Submit. Most important columns are first and third (Type partner is a bit misleading just risregard it). 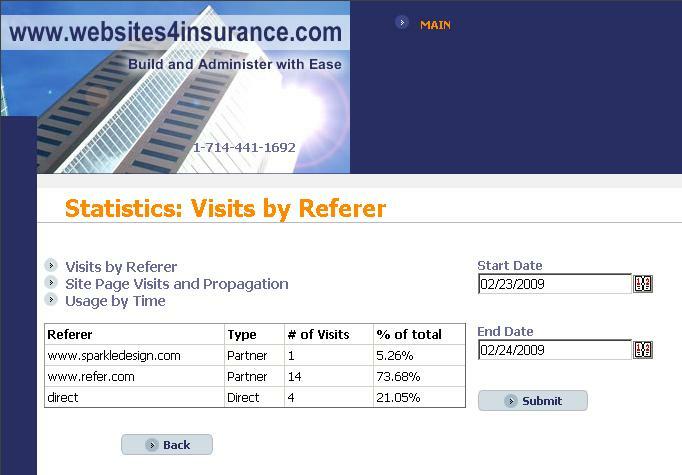 First shows the originating web site where a visitor clicked on a link that brought them to your site. If, for example, you were listed in superpages and somebody clicked on your listing you would see "superpages.com" there. In the third column it displays the number of visits from a given site over the (selected) period of time. After that it is pretty simple. Divide number of dollars you pay (if it is paid) to a given directory per listing by a number of clicks over the matching interval and you will get how much you pay them per click. Any number in double digits in not bad. teens are great. You can do it perhaps once every 6 months or so. Sooner if you feel you invested in one or more paid directories and you expect results immediately.